Transitioning to the big leagues is a step only made by the best in the business. It is for the champions. The ones who go the extra mile. That being the case, it is about time to cue up the speakers, turn on the key light, hush the crowd and get the camera pointed to the stage because the HJC RPHA 10 is about to go pro! Constructed of an advanced Premium Integrated Matrix of fiberglass, carbon fiber, aramid, and organic non-woven fabric, the HJC RPHA 10 Pro helmet is an option that is meant to be put to use by the most demanding riders on the road, or the track. Maximum airflow that enters through the top vent and disperses throughout by means of a well-constructed channeling system keeps this helmet cool and comfy even on those hot days on the tarmac. Additional features include a plush SilverCool plus liner, extreme ease and simplicity of shield change, and a Pinlock prepared HJ-20 faceshield to keep you fog-free all day long. Aside from the newly minted solid colors, the HJC RPHA 10 Pro Lorenzo Replica 3 helmet offers riders the chance to rock the same graphic as one of the most popular racers in MotoGP. Built out in true motorcycle-racer fashion, the graphics on this lid are bold, unintimidated, and laced with invigoration. 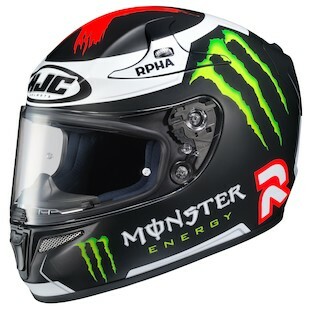 Heavily branded with Monster energy drink logos and with Lorenzo’s unmistakable aesthetic taste sprinkled throughout, the RPHA 10 Pro Lorenzo Replica helmet is one that will appeal to the ardent track day and MotoGP aficionados. 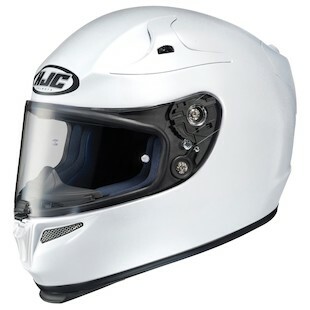 New for the Fall of 2015, the RPHA 10 Pro from HJC is an attention-grabbing, podium-topping helmet for riders in search of the top-of-the-line in the HJC repertoire.